This is the final post for my 2016 Take 12 Trips challenge, then I will be all caught up. So, let’s get on with it shall we? Laufenburg in Aargau, Switzerland and Laufenburg in Baden, Germany are two towns that used to be one… until Napolean decided to place the Swiss/German border right in the middle of the Rhine, leaving the two parts of the town in two different countries. A bridge connects the two, and every year the towns join together to hold a cross-border Christmas market, with stalls in each of the towns and also across the bridge. I loved the idea of a Christmas market in two countries at once and as soon as I read about it I knew I wanted to go. The market is only on for one weekend in December, but luckily we had time that weekend – and Laufenburg is only about a 20-minute train ride away. On arriving in the Swiss Laufenburg, we immediately saw the ruins of a castle on the hill, so that was our first stop. You can climb the tower that is all that remains of the castle and get a nice view of both Laufenburgs. We could actually see the market from up there as well, but I couldn’t get a photo because there were trees in the way. The roofs at the front are in Laufenburg, Switzerland. The sunlit buildings at the back are in Laufenburg, Germany. Back down from the tower, we took a wander through town in the general direction of the river, working on the assumption that we would have to come across the bridge (and thus the Christmas market) somewhere down there. The town turned out to be really pretty, so of course I took photos. After a while, we reached the Rathaus (town hall), where we could already see signs of the Christmas market. The Christmas market stands did look very cool crossing the bridge! Also, the two photos below were taken from different countries. Apologies for the photo overload… and I haven’t even included all of them! By this time it was getting a bit chilly, so it was time for some Glühwein. We chose a stand that was selling a cherry version. Then we moved on to another stand for a bacon waffle… I had never seen anyone put bacon bits in waffle batter before but it was very tasty! Having eaten , we wandered our way back through the German side and back onto the bridge, where we picked up a Christmas gift for Jan’s mum and grabbed another Glühwein. Back on the Swiss side, we found another bit of market round the corner from the bridge, bought some biscuits and a marshmallow snowman from a stand run by a school (the snowman later went in some hot chocolate) and even spied a Santa on a motorbike before deciding it was time to head back to catch our train. I was expecting Laufenburg market to be tiny, just going across the bridge with maybe one or two stands on either side, but it turned out to have a lot to offer. There are various different food and drink stands along with ones selling hand-made items (there were some lovely bird feeders! ), jams and condiments, candles and more. They certainly go to a lot of effort for something that’s only on for three days! The Christmas market and both of the towns are well worth a visit, and we’ve already decided that it would make a nice day trip with any visitors we happen to have in the summer. If you’re ever in the area and fancy doing something in two countries in one afternoon I would definitely recommend Laufenburg! This was my December trip for Take 12 Trips 2016, and meant I had completed the challenge for the second time! Waaay back in October, while we were in England, we spontaneously decided to visit Alnwick one sunny afternoon. It was too nice to be indoors, so we skipped the castle and purchased tickets for the gardens instead. Being October, a lot of the flowers were already on their way out, but I still managed to take many, many pictures! There was a kind of treasure hunt for children which seemed to involve finding all the different fairy tales and nursery rhymes that were referenced throughout the gardens, and I took great delight in spotting fairy tale items as well, even though I didn’t have a sheet to fill in. Alnwick itself is a pretty little town, and is home to the amazing second hand bookshop Barter Books, the place where the “Keep Calm and Carry On” slogan was first (re)discovered. It’s housed within the old Alnwick train station, with the bookshelves where the tracks used to be and space to sit and read in what used to be the waiting room. Unfortunately, we didn’t have time to visit Barter Books that day, but if you ever find yourself in Alnwick you definitely should! Before driving to Newcastle, where we were due to meet a friend for dinner, we of course had to stop on the Lion Bridge to grab a few shots of Alnwick Castle – which some of my may recognise from a certain film about a wizard with a lightning shaped scar… (others may know it from Blackadder). Alnwick is one of my favourite places and I’m glad we got to have a stroll around the town and its gardens last time I was home! On Saturday the sun was shining for the first time in what felt like weeks, so we thought we’d better make the most of it and go out for the afternoon (and it’s a good job we did – on Sunday the rain was back!). I suggested that we could take a trip to Arlesheim in Basel-Landschaft to see the cathedral, which is famous for being the only “Dom” in Switzerland. For those who don’t speak German, I shall explain. Dom means cathedral, and the one in Arlesheim certainly isn’t the only cathedral in Switzerland, but the others are either called Kathedrale – as in the Kathedrale St. Mariä Himmelfahrt in Chur – or Münster (minster), such as the Basler Münster (Basel Minster). Not that I’ve personally ever understood the difference between a minster and a cathedral even in English, but there you have it! Arlesheim is a cute little village – well, of course it’s cute, this is Switzerland! I’ve yet to see a village that isn’t cute! The cathedral itself is also kind of cute – it doesn’t look big enough to be a cathedral! But I suppose size isn’t a criterion. I felt kind of bad taking photos inside because everyone else in there seemed to actually be praying. It didn’t stop me though… I just tried to take my photos respectfully. After visiting the cathedral, which obviously didn’t take long, we decided to try and find a castle that we had spotted from the tram on the way to Arlesheim. It turned out to be very close to the village, at the top of a hill. To get there, we had to walk through the Erimitage (Hermitage), which you would expect to be some kind of religious building where hermits went to be along, but in this case is actually a landscaped garden. Apparently the original garden, which was destroyed, contained things like a suspension bridge, artificial tower ruins and a waterfall. These days, it’s basically a hill with steps that lead through various caves. It still looks pretty cool though! The castle turned out to be Schloss Birseck. We couldn’t go inside because it’s not open yet (and wouldn’t have been on a Saturday anyway). The opening times are May to October on Wednesday and Sunday afternoons. Saw this poking out above the castle grounds! Too bright for my camera! The Birs, by the way, is a small river – a tributary to the Rhine – and Eck (or Ecke) means corner. So presumably the castle is in a corner of the Birs. There’s also an area of Basel called Birsfelden, meaning Birs Fields. Across the road from Schloss Birseck, we saw a sign pointing to Burg Reichenstein, another castle. After about a 10 minute walk – during which I very much regretted my choice of thick tights and a winter coat (the temperature was more like mid-September than early-February!) – we found this second castle. A sign on the gate told us that a private function was currently in progress at the castle and only invited guests were allowed in, so after taking some photos of the outside we headed back down the hill via a different route, this time through the woods. My research tells me that, while you can book the castle for events, it’s not generally open to the public. There is a picnic area beside the castle with a public grill for barbecues – you just bring your own meat and (I presume) coal! Okay, that’s enough advertising Basel-Landschaft as a tourist destination for one day 😉 It’s time for lunch! I still have some things from last year to write about, but I’m skipping ahead a bit since this exhibition is still on and some people reading this might be interested in it. I had seen photos from this Lego exhibition on various blogs and really wanted to go to it, but so far it had never been anywhere near me, so when I discovered that it was coming to Zurich I was determined to go. It’s on until 10th January, but Jan is back at work today and on Wednesday we fly to England, so if we were going to go, it had to be yesterday. We took advantage of a RailAway offer, which gave us 10% off the train ticket and entrance fee and also included a day ticket for the Zurich tram network, and caught a train at just after 1 p.m. Finally, I loved this stained glass window, made from transparent coloured Lego bricks. It was hung in front of a light and the blue photo below shows the reflection it made on the floor. The Art of the Brick is being shown at Puls 5 in Zurich until 10 January 2016. Adult tickets cost CHF 24, or if you live elsewhere in Switzerland you can get a RailAway combi offer with 10% off the train fare and entrance fee plus a day ticket for the Zurich tram network. The offer is only available by phone or at the train station – it can’t be purchased online. I’m linking this up with the first 2016 edition of Monday Escapes. This has been a weekend of Christmas markets! Although, actually, it was far too warm to be standing around drinking mulled wine. No wonder I’m not ready for Christmas… the weather’s telling me it’s still no later than September! Our first Christmas market of the weekend was Colmar, which is only about 45-50 minutes away from Basel by train. Perfect for a day trip. There are, in fact, five markets in Colmar! Although one of those is just the normal indoor market with a few Christmassy stalls in addition to the normal ones that are there anyway, so it doesn’t really count as a Christmas market for me. One disappointing thing was a distinct lack of interesting food items – it took us ages to find anything we were even vaguely interested in. But Colmar is a beautiful town, and it looks even more magical all dressed up in its Christmas decorations. We were mostly there during the day, so I hardly got any photos with the lights switched on, but there are a few near the end. This will mainly be a post of images since there isn’t much to say beyond “We looked at stalls, drank mulled and managed to buy a few Christmas presents”. Also, the drinks came in horrible plastic glasses so I didn’t even get my usual souvenir cup! Yay, signs of Christmas already! Also, note the blue sky… most of the afternoon was slightly cloudy, but it was more like late September than the last weekend in November! It’s a “carousel bar” and it was actually rotating! There are no words. Finally, we reached the first part of the actual Christmas market and grabbed our first mulled wine, or “hot wine” as the French say. Wine in hand, we wandered on through the streets in search of the other markets, admiring the pretty buildings decked out in all their finery along the way. Some more photos of the town and markets. I love all the brightly coloured buildings! A Christmas tree made from skis! It turned out the snails didn’t taste of anything much… they were a bit rubbery and that was it. We also ordered a second, “normal” slice of bread in “Alsace” style, with onions, bacon bits and Munster cheese. That one basically tasted like burnt cheese on toast. Oh well, at least they weren’t expensive. I can’t say I particularly “liked” snails, but at least they didn’t make me gag and almost throw up (looking at you, oyster slime!). Finally, it started getting dark and I could see all the pretty lights! So, in conclusion, the Colmar Christmas markets are worth a visit and there are some lovely home-made items in the special crafts bit, bit I would recommend popping into a restaurant to eat (or bringing your own food!). The town itself is fairytale like at any time of year, and even more so when it’s all sparkly and Christmassy. The Christmas markets in Colmar are on until 31st December 2015. 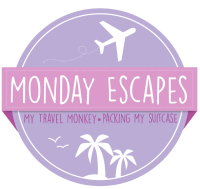 During the week, they close at 7 p.m. and on weekends (Fri/Sat/Sun) at 8 p.m.
I’m linking this up to Monday Escapes with Packing My Suitcase and My Travel Monkey. Click the button for more travel tales to brighten up your Monday.